Saxophoniste US né le 11 Juillet 1926 à Austin (Texas). 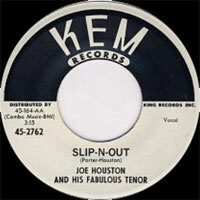 Joe Houston a débuté à la fin des années 1940, au Texas dans les orchestres d'Amos Milburn puis de Joe Turner. Ce dernier le pousse à monter son propre groupe. 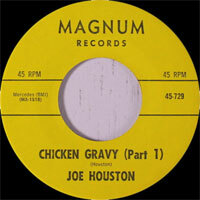 Houston débute sa carrière solo en enregistrant pour le label texan Freedom Records. 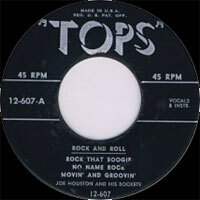 Dans les années cinquante, il est à Los Angeles et travaille pour une multitude de labels : Bayou Records, Imperial Records, Mercury Records, Combo Records Dootone Records et surtout pour les marques des frères Bihari, RPM, Modern et Kent. Son jeu est celui d'un « ténor hurleur » mis en avant dans des morceaux pour la plupart instrumentaux. Joe Houston est resté actif jusque dans la décennie 2000. 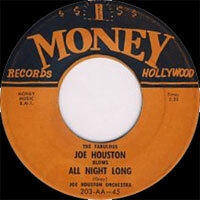 Joe Houston, a honking R&B saxman of wallpaper-peeling potency, recorded for virtually every major independent R&B label in Los Angeles during the 1950s. 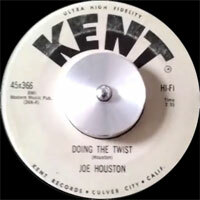 When the jump blues tradition faded, he segued right into rock & roll, even cutting budget Twist and surf albums for Crown that didn't sound very different from what he was doing a decade before. 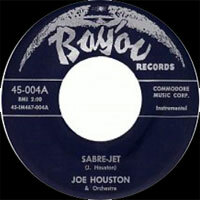 Houston played around Houston, Texas with the bands of Amos Milburn and Joe Turner during the late '40s. It was Turner who got the young saxist his first deal with Freedom Records in 1949. 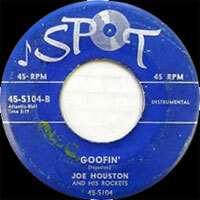 Houston found his way to the West Coast in 1952 and commenced recording for labels big and small: Modern, RPM, Lucky, Imperial, Dootone, Recorded in Hollywood, Cash, and Money (as well as the considerably better-financed Mercury, where he scored his only national R&B hit, "Worry, Worry, Worry," in 1952). 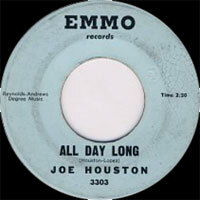 Houston's formula was simple and savagely direct -- he'd honk and wail as hard as he could, from any conceivable position: on his knees, lying on his back, walking the bar, etc. 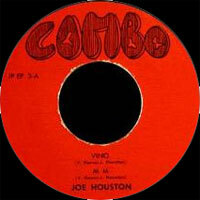 His output for the Bihari brothers' Crown label (where he was billed as "Wild Man of the Tenor Sax") is positively exhilarating: "All Nite Long," "Blow Joe Blow," and "Joe's Gone" are herculean examples of single-minded sax blasting. 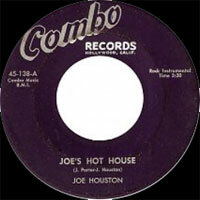 Joe Houston remained active musically into the 2000s, emphasizing his blues Vocals talent more than previously, until suffering a stroke in 2005. He re-emerged and began playing again for a period of time thereafter, but then retreated from the public and to the company of family and friends. 1950 78 t. FREEDOM F-1526 (US) . 1951 78 t. MACY'S 5014 (US) . 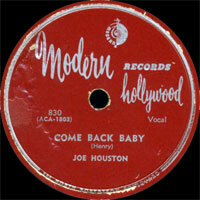 1951 78 t. MODERN ‎830 (US) . 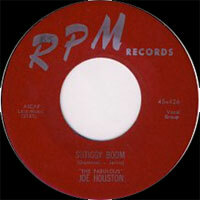 Blow Joe Blow / ? 1951 SP MODERN ‎830X45 (US) . 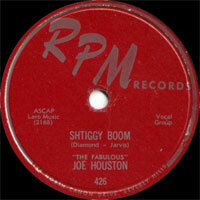 Blow Joe Blow / ? 1951 78 t. SPHINX 122 (US) . 1951 78 t. MERCURY 8248 (US) . 1952 78 t. IMPERIAL 5183 (US) . 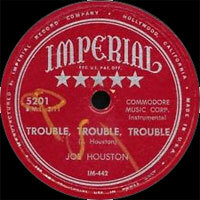 1952 78 t. IMPERIAL 5196 (US) . 1952 78 t. IMPERIAL 5201 (US) . 1953 78 t. IMPERIAL 5213 (US) . 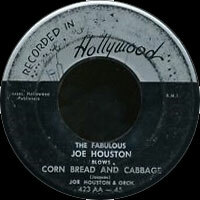 1953 78 t. RECORDED IN HOLLYWOOD 423 (US) . 1953 78 t. BAY'OU 4 (US) . 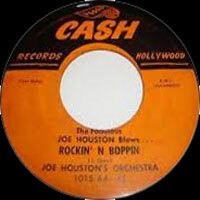 10/1954 78 t. MONEY 203 (US) . 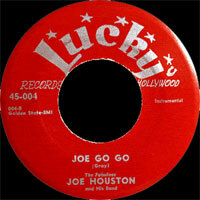 1954 78 t. LUCKY 004 (US) . 1955 SP CASH 1013 (US) . 1958 SP COMBO 45-142 (US) . 1958 SP DOOTO 439 (US) . 1961 SP KEM 45-2761 (US) . 1962 SP KENT 45X366 (US) . 1964 SP Magnum ‎45-723 (US) . 19?? SP MODERN OLDIES 16 (US) . 19?? SP MODERN OLDIES 37 (US) . 1978 SP BIG TOWN 720 (US) .